Arkansas fans are mad and they should be, their team just lost to LA Monroe. As Bama fans, we know the feeling having lost to them back in 2007. But unlike Bama fans, we knew it was just growing pains and things would get better down the road; can't say the same for Arkansas fans. 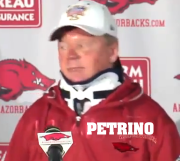 Arkansas fans are confused about where the should put the blame,but Chris Low of ESPN has a pretty good idea where it should start-former head coach Bobby Petrino. Before the Petrino mess earlier this year, Arkansas was suppose to contend for a national championship and FINALLY be on the same level as Alabama and LSU, now they are looking at a long season all because of one man. To read more of Chris Low's article check out this link from ESPN.